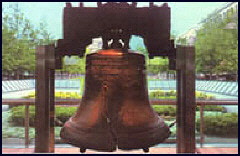 The 2001 convention of the National Federation of the Blind will take place in Philadelphia, Pennsylvania, July 1-7. Arrangements have been made to hold our convention at the Philadelphia Marriott, a first-class convention hotel. Room rates are excellent: singles $55, and twins, doubles, triples, and quads $65 a night, plus tax.�� The hotel is accepting reservations now. A $60-per-room deposit is required to make a reservation.� Fifty percent of the deposit will be refunded if notice is given to the hotel of a reservation cancellation before May 29, 2001.� The other 50 percent will not be refundable. For reservations call the hotel at (215) 625-2900 or the Marriott toll-free number (800) 228-9290. ��������� Rooms at the Marriott will be available on a first-come, first-served basis.� Reservations may be made to secure these rooms before May 29, 2001.� After that time the hotel will not hold the block of rooms for the convention.� In other words, you should get your reservation in soon.� We will probably need rooms beyond those we are holding at the Marriott, so those who get their reservations in first will get the rooms we have reserved there. ��������� Participants in the 1999 and 2000 conventions can testify to the gracious hospitality of the Marriott.� The Philadelphia Marriott has excellent restaurants, first-rate meeting space, and other top-notch facilities.� It is in downtown Philadelphia across the street from the Reading Terminal Market, an establishment which combines the sites, smells, experiences, and tastes of Philadelphia cuisine and the Amish Farmers' Trading Center.� Other attractions of Philadelphia are immediately at hand, and of course the convention will be occurring in the spacious ballroom of the Marriott.